Here is one Crossnumber puzzle. 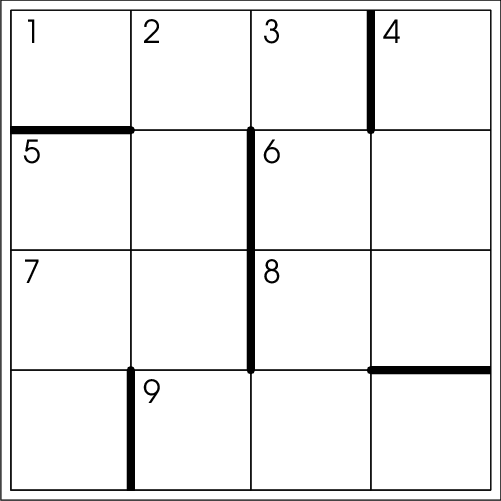 In addition to the regular rules, both the clues and the grid use a number system of base greater than ten, with being some digit greater than 9. 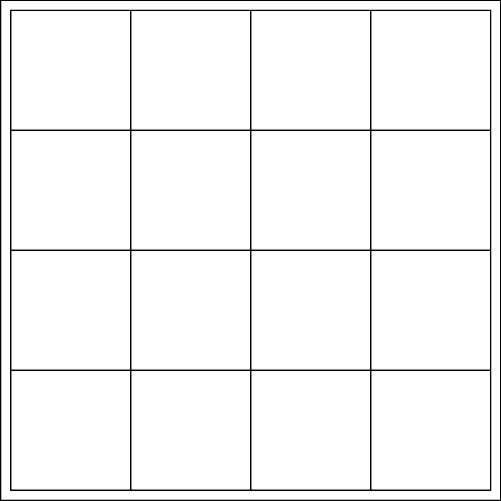 No addresses are given for the clues, nor are they listed in order; all multidigit numbers in the grid, and multidigit numbers only, are clued. Not a multiple of 5. Not a multiple of 6. Not a multiple of 7. Here is one Crossnumber puzzle. 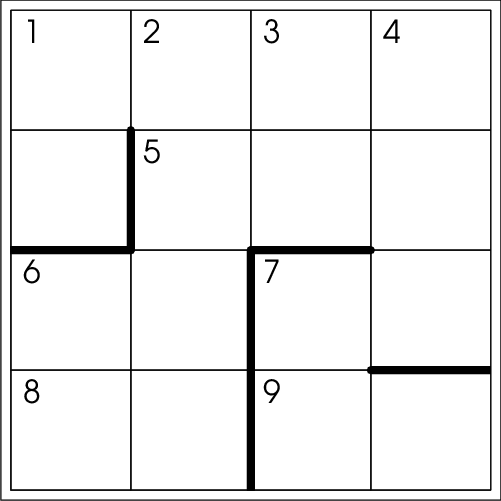 In addition to the regular rules, no walls have been placed in the grid: recovering the walls’ positions is part of the puzzle. All cells form a single connected region; as usual, all straight runs of two or more cells are clued (but no run of a single cell is), with clue numbers increasing from left to right and from top to bottom. Across: 2. All its digits are equal. 4. One less than a multiple of 11. 5. A cube read backwards. 8. The sum of its digits is 11. 9. A pentagonal number. Down: 1. Its digits form an increasing geometric progression with an integer common ratio. 2. A triangular number. 3. One more than a multiple of 11. 4. Its digits form an increasing arithmetic progression with common difference equal to one. 6. A Fibonacci number. 7. A prime. 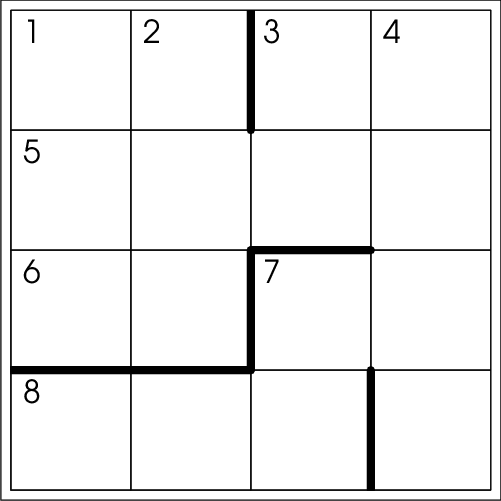 Here is one Crossnumber puzzle. In addition to the regular rules, no clue addresses are given and the clues are not listed in order. All multidigit numbers, and multidigit numbers only, are clued; determining which clue corresponds to which address and which clues are referenced within other clues is up to you.
. Two times the cube root of .
. One half plus half the square root of .
. The index of in the Fibonacci sequence ( , , ).
. All its digits are equal.
. One of the two prime divisors of .
. A multiple of 26.
. The sum of its digits is 6.
. The sum of its digits is 15.
. An odd number the sum of whose digits is 12.
. Four times the square of . Here is one Crossnumber puzzle. Across: 1. Not coprime to 3 across. 3. A Fibonacci number. 5. Not a triangular number. 7. 101 times 10 across. 9. The sum of its digits is 10. 10. A triangular number. Down: 1. 7 across read backwards. 2. 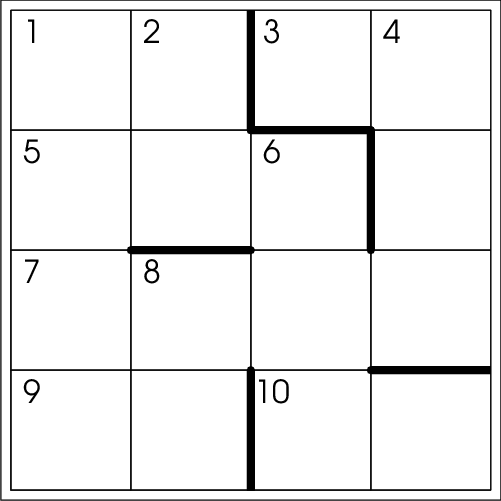 Equal to 10 across. 4. 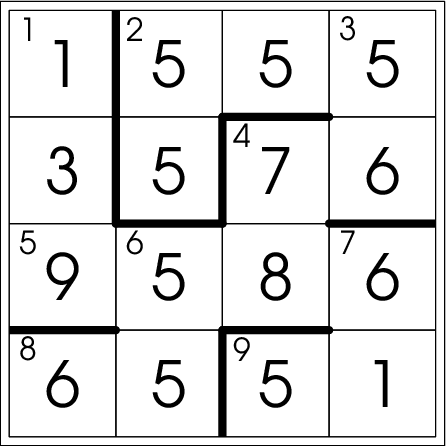 The sum of its digits equals that of 5 across. 6. A multiple of 37. 8. Not a prime number. Once you’ve completed the solution, a pattern will emerge. 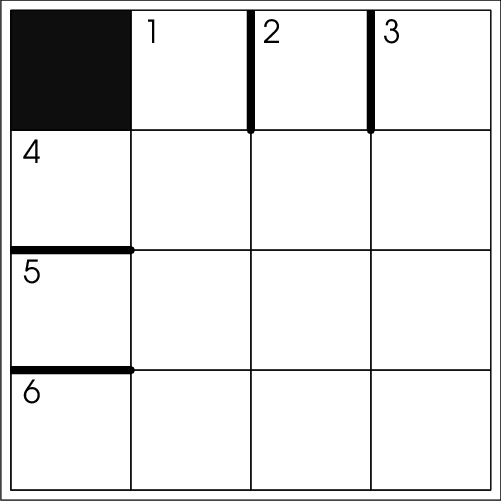 Here are two Crossnumber puzzles. Across and Down: All numbers must be perfect squares, with 1 down equal to 1 across, 2 down equal to 5 across, etc. 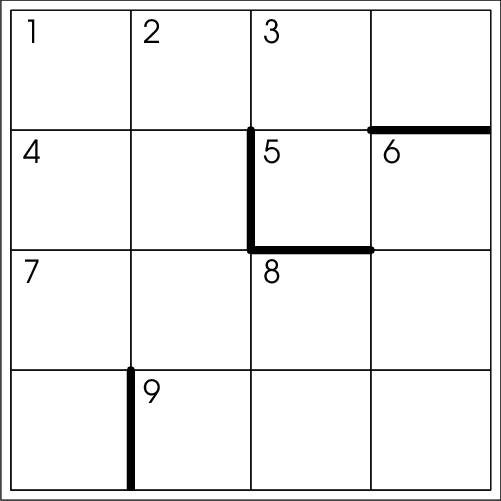 Additionally, each of the following two conditions makes the solution unique: (a) the sequence of three shaded squares must spell out a perfect square as well, or (b) no cell should contain the digit 0. Across and Down: All numbers must be perfect cubes. In the unique solution 1 down turns out to be equal to 4 across, 2 down to 5 across, etc. Across: 1. A multiple of 7 down. 3. One-ninth of 2 down. 5. The sum of its digits is 19. 6. One plus a multiple of 11. 7. A prime. 8. A palindrome. Down: 1. A palindrome. 2. A multiple of 7 down. 3. A prime. 4. A square. 7. The square root of 8 across. Across: 1. A multiple of the number which is two less than the square root of 2 down. 5. The square root of 5 down. 6. Not a multiple of 4. 7. Two times 8 across. 8. The square root of 4 down. 9. A multiple of the number which is two less than the square root of 2 down. Down: 2. The square of a prime. 3. A multiple of 11. 4. 5 down read backwards. 5. 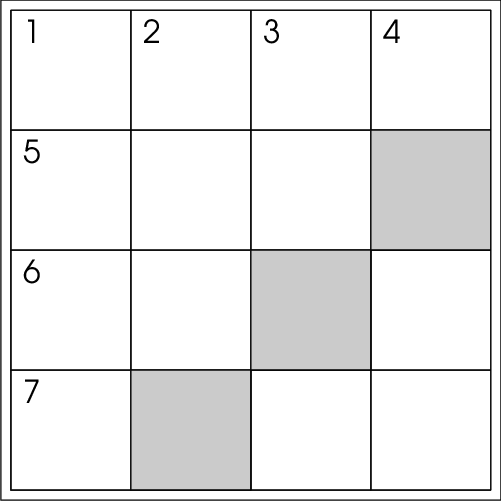 The square of 5 across.